Nvidia has just announced its HGX-2 cloud server platform, which it claims powers "the fastest single computer humanity has ever created". 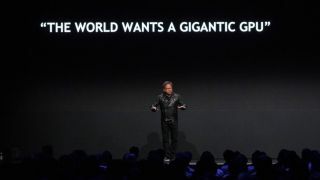 It combines 16 Tesla V100 graphics cards, which work together to create a giant virtual GPU with half a terabyte of GPU memory and two petaflops of compute power. This is achieved using Nvidia NVSwitch interconnect fabric technology, which links the GPUs together to work as a single GPU. The announcement was made at Nvidia’s GTC (GPU Technology Conference) event in Taiwan, which is a bit of an appetizer before the main course of Computex 2018 arrives next week. While the HGX-2 certainly has some mind-blowing specifications, it won’t be used in standard computers. Instead, it will be capable of high-precision calculations using FP64 and FP32 for scientific computing and simulations, while enabling FP16 and Int8 for AI training. According to Nvidia, the HGX-2 has achieved record AI training speeds of 15,500 images per second on the ResNet-50 training benchmark, and is powerful enough to replace up to 300 CPU-only servers. At Computex 2017, Nvidia announced the HGX-1 which became pretty popular, being used by companies that rely on massive datacenters such as Facebook and Microsoft. Nvidia has high hopes for HGX-2 as well, with some major businesses, including Lenovo, QCT, Supermicro, Foxconn and Wiwynn, announcing plans to launch HGX-2 systems this year. The HGX-2 is powered by the Nvidia Tesla V100 GPU, which comes equipped with 32GB of high-bandwidth memory to deliver 125 teraflops of deep learning performance. Combining 16 of those GPUs together is going to produce some excellent results. Nvidia also showed off the Nvidia DGX-2, which is the first system built using the HGX-2 server platform, and comes with 2 petaflops of computing power and 512GB of HBM2 memory. According to Huang, “this is the fastest single computer humanity has ever created”. Pretty exciting stuff.